Ramazanov ist einer von mehreren aserbaidschanischen Häftlingen, Aktivisten und Oppositionellen, die sich aus Solidarität mit dem inhaftierten Anti-Korruptions-Blogger Mehman Huseynov im Hungerstreik befinden. Rashad Ramazanov, der Ehrenmitglied des PEN Canada ist, protestiert auch gegen seine eigene fortgesetzte Inhaftierung. Er wurde vor fast sechs Jahren verhaftet und zu neun Jahren Gefängnis verurteilt, weil er angeblich Drogen besessen und verkauft haben soll. PEN International, der die Anklage gegen ihn für politisch motiviert erachtet, ist tief besorgt um seine Gesundheit und fordert seine sofortige und bedingungslose Freilassung. 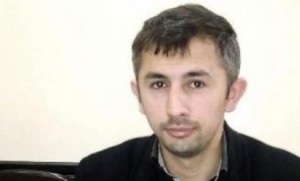 Writer and blogger Rashad Ramazanov (pen-name Rashad Hagigat Agaaddin) was arrested on 9 May 2013 and sentenced to nine years in prison on charges of ‘illegal possession and sale of drugs’ (Article 234.4.3 of the Criminal Code). Rashad Ramazanov is well-known for his anti-government postings, and PEN International considers the charges against him to be politically-motivated. In January 2017, he was punished with 15 days in solitary confinement for reasons unknown. He suffers from a number of health problems as a result of his imprisonment, most serious being tuberculosis, which he contracted when he was arbitrarily detained in 2005. His family report that he is in poor health, concerns that are exacerbated by his current hunger strike. Mehman Huseynov, one of Azerbaijan’s most popular anti-corruption journalists and blogger, was sentenced to two years in prison in March 2017 for defaming the staff of a police station, after he dared to go public about the abuse he allegedly suffered at the hands of police officers. On 26 December 2018, two months before his scheduled release, the Azerbaijani authorities claimed that he resisted and physically assaulted a prison guard, charges which he strongly denies. He is one of five critics imprisoned on politically-motivated grounds who were about to complete their sentences and against whom the Azerbaijani authorities have brought new spurious charges in a bid to keep them detained. He faces up to seven years in prison if convicted and has been on hunger strike since 26 December 2018 in protest. He is reportedly in a critical condition. Adopt a so-called ‘zero political prisoners policy’, including a review of all existing cases in cooperation with human rights activists. The European Parliament will debate an urgent resolution on Azerbaijan on 17 January 2019. The resolution notably calls on the Azerbaijani authorities to immediately and unconditionally release all those arbitrarily detained, including Rashad Ramazanov. Dieser Eintrag wurde veröffentlicht in Aktuelles, Rapid Action Network, Writers-in-Prison von PEN-Zentrum. Permanenter Link des Eintrags.